An NKBA designer can add beauty, functionality, and value to your home. 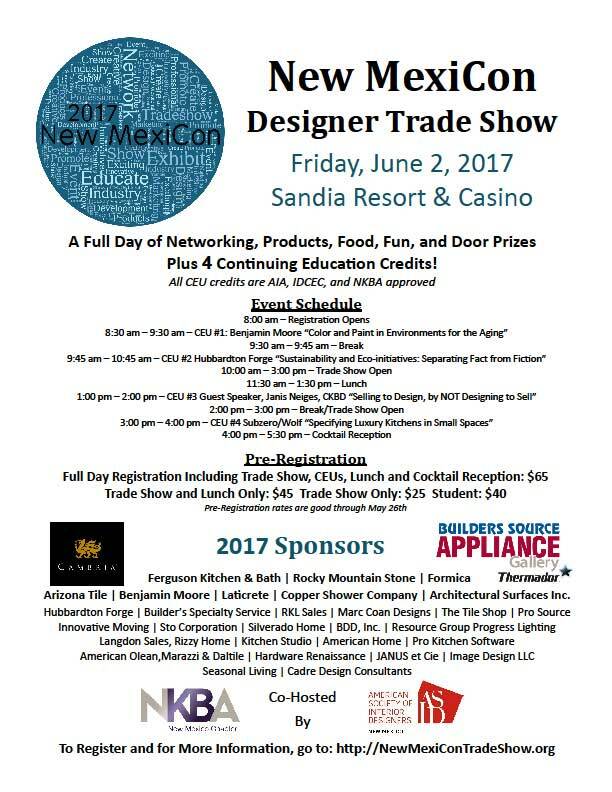 NKBA New Mexico Chapter designers can bring the products, craftsmanship, and style you’re looking for to your project. Click here to visit the NKBA New Mexico website. The New Mexico Chapter Annual Holiday gathering and celebration will be a wonderful way to start this season with food, beverages, beer and wine, and many door prizes, it will event to truly enjoy. Join the NKBA New Mexico Chapter for a fun, informative night of food, beverages, networking and a CEU: Natural Stone 101 presented by Scott C. Lardner. Scott is past President of the Marble Institute of America and currently serves as inspector and adviser of the Natural Stone Institute Accreditation program. This 1-hour presentation is designed to enhance your understanding of stone, and your ability to select the right stone, fabrication technique and finish for your project. Our regular Bi-monthly Chapter Meeting, August 1st, from 5:30 pm-8:00 pm at Dreamstyle Remodeling in Albuquerque. .2 CEUs! We will have great time, wonderful food, fantastic people in our industry to network with, and a presentation on Finding Hidden Profits in Kitchen Design & Remodeling presented by Dennis Dixon. Dennis is a 35+ year veteran builder, remodeler and consultant for residential and commercial projects. The second edition of his book, Finding Hidden Profits has been well received within the industry. New Mexico Chapter luncheon meeting with a presentation by Maria Stapperfenne, CMKBD titled: Design for Independence and Dignity Without Talking About It. This is a .1 CEU presentation that concentrates on the elements of aging, developmental and cognitive issues that we should be taking into account as we continue to design spaces for humans of varying degrees that will occupy these spaces. What considerations should we, as design professionals, take into account to create safe, comfortable and accessible spaces for everyone, and when to collaborate with a team of professionals to take it to the next level including contractor, occupational therapist, or other medical professional. The end includes “next steps: for people that wish to explore further or pursue more education. This will be a regular Chapter meeting with Builders Source providing dinner as well as the CEU presentation: Demystifying Appliances-Be in the Know! Presented by Christine Villanueva of GE. Course code CEU-106196. This course was written by a CMKBD and is meant to take you beyond Appliances 101 and into the features that you really need to know to sound like the expert that you are. Take some time out of your day on Wednesday, October 11, to join us for lunch and a special CEU by Ellen Cheever, CMKBD, ASID, CAPS, CLIPP. Ellen will be presenting a CEU on an intriguing trend that is emerging for many homes: a second support kitchen. For some, it is a small kitchen that is part of a separate living area within the house. For others, it’s a clean-up or prep center separated from the open gathering kitchen. Homeowners are interested in appliances being installed in entertaining areas – or even their master bedroom. For some families, a separate cooking area reserved for ethnic cooking is desired. We have many homes around here with casitas where we place a smaller second kitchen. But with the open concept in the homes today, homeowners are finding that they want to hide some of the messier functions of the kitchen. They are requesting a clean-up and/or prep center that is separate from the main open-concept kitchen. Ellen will present new ways to approach the planning process for these requests. She will discuss new interview questions to be asked, technical information about new appliance innovations and placement ideas, as well as a refreshed look at the ideal storage systems for these types of spaces. Lunch will start at 11:30 with the CEU from 12:00-1:00 pm. Join us on Wednesday, August 2, at Floorscapes in Albuquerque. Learn more about wood look flooring with our informative CEU that explores the various flooring options to achieve this hottest trend. RSVP Today! Join us from 5:30-6:30 for an hour of networking and dinner. The CEU presentation will start at 6:30. If you can’t make it until after 6:00 it’s no problem. There will be plenty of food and you can continue to eat while we start the presentation. This informative and useful course will focus on the period detailing and the impact of plumbing on bathroom design. Period detailing specifics will explore the impact that indoor plumbing has had on society and bathroom design. The Classic Era Victorian, Pre-War Era Art Deco, Modern Era Mid Century, Contemporary Era Post Modern periods will be explored in detail. Did you miss out on attending KBIS 2017 in Orlando? What were the coolest products showcased at KBIS? Join us on at Arizona Tile in Albuquerque for a fun informative night recapping the best of KBIS 2017. Ellen Cheever, CMKBD, ASID, CAPS, has spent the past 44 years redefining the kitchen and bathroom for North American consumers and industry professionals. Holding a Bachelor of Arts degree in Home Economics from California State University, Ellen’s career has included work in the showroom-based sector of the industry, and has practiced as an independent designer. Her creative talents are well grounded in years of managing design/build projects. She has been responsible for launching new products and developing new dealers as an executive in the cabinet manufacturing part of the business. She has traveled the road as a “Manufacturer’s Rep”, as well as managed thought-provoking, dramatic, designer-focused incentive adventures. She has been around long enough to know what both success … and failure feels like. And, how the best pros in the kitchen and bath industry always rebound from economically challenging times. Though her focus is specific, her expertise touches many venues. As product consultant, author, designer and industry spokesperson, Ellen educates and impacts the lives and workspaces of homeowners, designers and manufacturers. Denise Butchko is a passionate design and marketing advocate who splits her business focuses between teaching design and marketing design. In the marketing realm, she helps businesses leverage their brand by incorporating social media strategies and applications into their marketing and organizational culture. In the design realm, she designs custom closets and storage solutions and teaches others how to do the same. She has authored “How To Design a Walk In Closet” and “The Consumer Guide To Closet Design” and offers “Closet Design 101” as a training program for professionals seeking to add closets onto their business offerings. As a collaborator with designers and architects, she’s been able to merge design and marketing skills, for messaging and methodologies that are laser focused. In today’s current marketing environment, filled with “social everything”, this is where she feels right at home and invites you to join her there. In this CEU by Koroseal, learn the advantages of specifying wood veneer wallcoverings. Gain a better understanding of how to specify suitable wood products for interiors based on product construction, code compliance, cost impacts, and installation requirements. PowerPoint presentation supported by course handout and extensive sampling. Presented by Rae Peronneau. Rae Peronneau is a UCLA graduate with over 15 years in sales, marketing, and management, in the A&D industry. She has either covered or managed California, Oregon, Washington, Arizona, Nevada and Hawaii for wallcovering, wall-protection, textiles, and acoustical products. At this time she is the National Accounts Manager for the West Coast as well as Koroseal’s Arbor specialist. This CEU by 3form educates audiences on the importance of acoustic design and the future of acoustics with the purpose of creating favorable experiences for occupants. Presented by Marie Herr, Sales Representative for 3form in Western/Southern Colorado and New Mexico. She graduated from Colorado State with a Bachelor’s Degree in both interior design and business management. She has been with 3form for 3 years and is based out of Denver. Jeffery Dross, Corporate Director, Education and Industry Trends at Kichler is presenting this CEU on how lighting affects our natural body rhythms and functions. Natural Light – The direction, intensity and color of natural light has always served the needs of humans, plants and animals. Artificial Light – From fire to LED, humans have used some sort of artificial light source. Why now has light become an issue of concern? Health – With an understanding of the eye and the Circadian Rhythm we will then look at a number of health issues and possible health concerns that have been impacted by the inappropriate use of light and how correct lighting can improve a person’s overall health and wellbeing. With new technology, more needs to be considered in the planning stages of good lighting solutions. In 1974, while studying Architecture, Jeff started his career in residential lighting. Chiefly concerned with running Engineering for 25 years, he has since been involved in many other facets of the business including Product Management where he concentrated on Systems and Energy Efficient lighting, QA, Graphics, production trouble-shooting, International vendor communications and an ERP systems implementation. He is currently Corporate Director, Education and Industry Trends while continuing as their often-quoted media spokesperson. Jeff understands that the face of residential lighting is ever changing and has been involved in a number of industry roundtables that are working to plan for the future. Jeff has also authored a number of articles about lighting for trade publications, consumer magazines and web journalism. He is the recipient of the American Lighting Association’s 2015 Pillar of the Industry Award. He presented this CEU at the 2016 KBIS Voices of the Industry. “Advances In Kitchen Appliances” encourages us to consider how kitchen appliances contribute to new consumer lifestyle trends. This course takes a deeper look into the three most popular kitchen trends as recognized by The International Home and Housewares Show (The Green Kitchen, The Wellness Kitchen, and Cooking For Fun) by walking through the newest innovations offered in the appliance industry today. This CEU is presented by Dave Ferguson, Builder Sales Manager for BSH Home Appliances (Bosch, Thermador & Gaggenau). He is responsible for builder sales in the Southwest and Mountain Region. Mr. Ferguson has been with BSH for a total of 12 years and in the Kitchen and Bath Industry for over 25, with a portion of that time having been spent as an independent appliance dealer in the Las Vegas Market. Founded Centauri Sales February 1988 in Albuquerque, NM after Eight years in the Electrical Distribution Business and Four years as an Electrician. Two Daughters and Four Grandchildren All in Albuquerque! Couldn’t make it to KBIS this year? Went to the show but didn’t see everything? Come join us for a presentation about the most exciting products and trends shown at KBIS this year! Our board members and volunteers will be researching all of the latest and greatest in Appliances, Cabinets, CAPS, Lighting, Plumbing, Surfaces and Window Treatments! Also, come meet our new board members! We have three new members this year and we want you to help us introduce them! We will be giving away a $25 Target gift card, and announcing the winner of our $250 Southwest Gift Card from 2015!